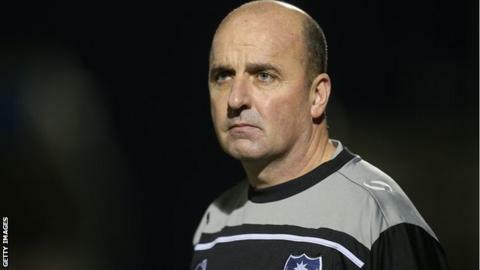 Portsmouth manager Paul Cook believes Tuesday's FA Cup third-round replay at home to Ipswich is "a free hit". The sides drew 2-2 at Portman Road, with a tie against Premier League side Bournemouth awaiting the winner. "I think we'll have certainly earned Ipswich's respect in the first tie and on Tuesday we'll probably see another animal," Cook told BBC Radio Solent. "If Ipswich turn up and play what would be their strongest team, we would have our hands completely full." Pompey have fallen to fifth in League Two after their game at Accrington on Saturday was postponed. Ipswich, meanwhile, are only outside the Championship play-off places on goal difference and are unbeaten in six matches. "People say it's a free hit for us and it is, that's the reality of the game," added Cook. "It's possibly not such a free hit for Ipswich because when you're the Championship team you're expected to win, and as a League Two team we're not. "Our job is going to be a difficult one, but with the attraction of a Bournemouth home tie in the fourth round it's very much something we'd like to achieve."